Gundam (ガンダム, Gandamu) is a meta series of Japanese anime, featuring giant robots, or "mecha", created by Sunrise studios and Bandai. Mobile suiit Gundam story is about war between earth and colonies from outer space due to some certain reason or dissatisfaction of both side. Gundam created as a mobile weapon in the battle field..well, as a die hard fans of gundam, i could not agree more that gundam is a very nice anime, this is because it show how advance of technology used in war in the future, how a human can control a mobile suit during the battle, how big the damage it can create. There is a lot of different series of Gundam anime, every gundam has their own abilities at the battle field such as light saber, beam canon, giant machine gun, and missle. After i watch the anime, i think gundam do exists one day in the future due to the improvement of the technology, besides there is something we can learn from Gundam that is stop war. 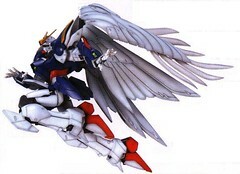 I fully back that up Gundam not only will be in the future but they will rul the sky. I don't know if your American or not but even if your not I will let you know this we as in America control the skys now. In the future we will continue which should let you know that even if we are not the first to create them we will be the ones who have Air Superiority with the Gundams. I can tell you what they will start out as.....but only if you want to know.